Fifty-one years ago, the photographer Erich Hartmann created his exhibition Our Daily Bread and presented it at the New York Coliseum. In this gigantic exhibition and conference space located at Columbus Circle in the heart of Manhattan, the photographer mounted more than one hundred photographs on panels that were more than a meter high and a meter wide. The exhibition was commissioned by the Pillsbury company, which wanted to present the project during an international conference on recent food innovations. The exhibition was an enormous success and would travel to several American cities. This project was initially a classic photojournalism commission. But over the course of years, Hartmann would continue to work on theme until he created a type of poem in images, a lyrical tribute to those who produce and provide our daily bread. Nothing is left of the original exhibition. The prints went up in smoke during a fire at the Minnesota warehouse where they were being stored. The New York Coliseum was demolished in 2000. The only traces that remain of the colossal work that took Erich Hartmann more than eight years to produce are the prints made by Hartmann or under his supervision, the negatives, and the vivid memory of his wife, the author of the texts in the book version of Our Daily Bread. When the decision was made to publish Our Daily Bread (Kehrer Verlag Editions), the idea of creating an accompanying exhibition was something of a gamble, a bet that was a little risky but that had to be placed. Beyond the question of the financing, what concerned me was the choice of the proper location and forum for a new version of such an emblematic exhibition. Throughout Hartmann’s 47-year career, in both his work with the Magnum Agency and his own personal photography, he showed such flawless precision that presenting his project required both respect and prudence. To exhibit his work in a random space that had no connection to the spirit of the œuvre would only be an error. A space had to be found or imagined that was grand enough for the power and expression of these black-and-white photographs to be properly appreciated. Was it destiny or perhaps the good angel of photography that allowed me to meet Beatrice Schmidt last summer? Schmidt organizes events for the Französischer Dom in Berlin. Those who visit the German capital and want to admire the horizon and the skyline, scale the almost 300 steps that lead to the city’s bells and carillons. The climb in the heart of the cupola offers a magnificent view of the Gendarmenmarkt Square. An ingenious system of moldings was created so that work could be hung in the cone of light that went from the cupola to the ground. They seem to be floating in the air. The space was intriguing. It was certainly an unusual place for an exhibition, but it was incredibly evocative. In the center of Berlin, the present and the future are never too far from a past that was violent and devastating. For the Jewish photographer Erich Hartmann, who was born in Munich in1922 and who had to flee Nazi Germany with his parents in 1938, words and images always took on a humanist dimension that emphasized the connections between people and everything that was universal. Hartmann was fond of repeating how people were connected by an ever more intimate form of interdependence and that, as with artists, this should be a major subject of personal introspection. So, one must scale the steps to see these images printed from the vintage negatives from the original exhibit. These new images carry the marks of time. But above all else they show the excellence of the image, the vision the photographer had of his subjects, this vision that was perfectly honed and which invited those who view them to truly see what Hartmann considered important: the splash of light where a few crusts of bread thrown into the streets of New York now lay, soon to be crushed by passing cars. 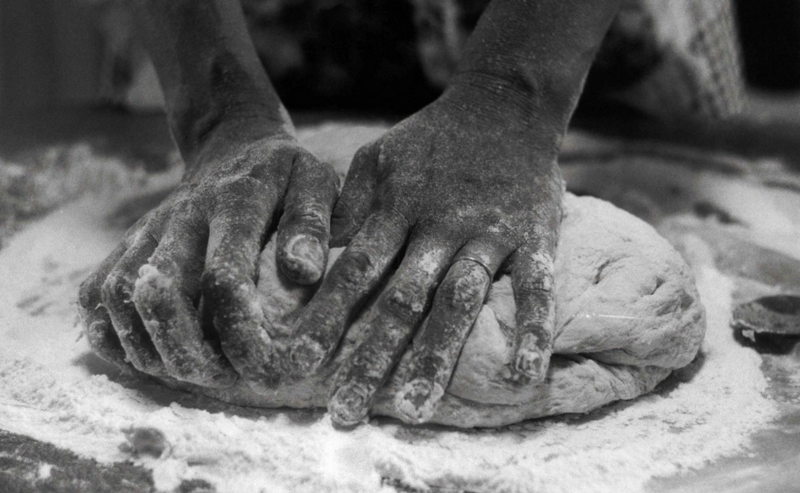 The pair of hands glorified as they work the dough. The two women who stand before a sparse table that nonetheless allows the bread to be royally displayed in the center. Wheat shown in such an extreme close-up that it becomes something abstract. Isn’t this also what Hartmann wanted to show? That what is so ordinary, so banal, so necessary to survival also has an otherworldly power? In this way, the new exhibition isn’t merely a re-edition of the first, a re-make of the 1962 exhibition. It is an invitation to immerse yourself in the œuvre of a great photographer who intimately identified with his fellow men and women. Posted in Anna's Eye .